As part of my ongoing series in exploring the Clone Wars, I wanted to kick off my exploration of Star Wars: The Clone Wars with the recently-released season 6. In this post, I wanted to share my five favorite episodes. I realized I gave priority not only to really neat fighting, but primarily what advanced the storyline. And, as you can see, I did not particularly care for the Clovis story arc, which is, as Eric Goldman of IGN writes, the weakest of the story arcs for the season. #1 – “The Lost One” – interestingly, the only one-off episode (not part of a larger story arc) in season 6. 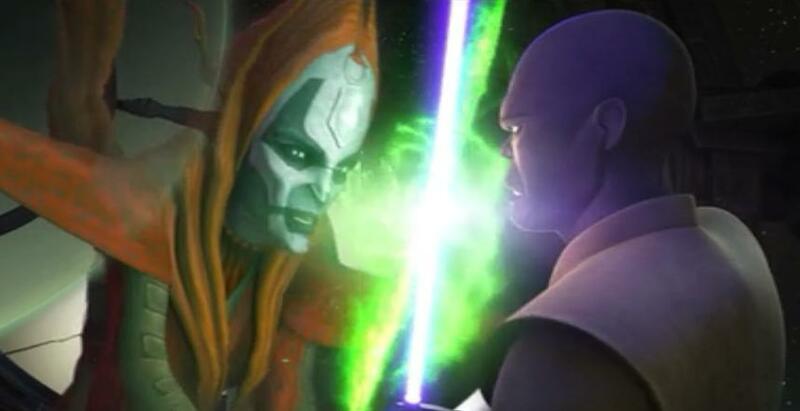 We find out more about Master Syfo-Dyas and some of the intrigue going on around his death. 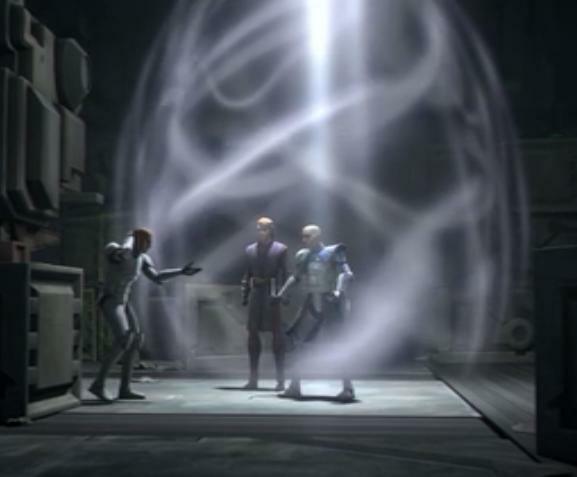 We discover that while he did order the clone army, he was, however, killed by Dooku. I think I enjoyed this episode the most since we learn about Master Syfo-Dyas, as well as we understand some of the intrigue surrounding him, and we learn about his role in their creation. #2 – “The Disappeared, Part I” – I tremendously enjoyed this episode, despite Jar Jar Binks! it’s hard not to think, “Really, we’re gonna take two precious episodes and waste them on Jar Jar?” But the thing is… they’re actually pretty entertaining. 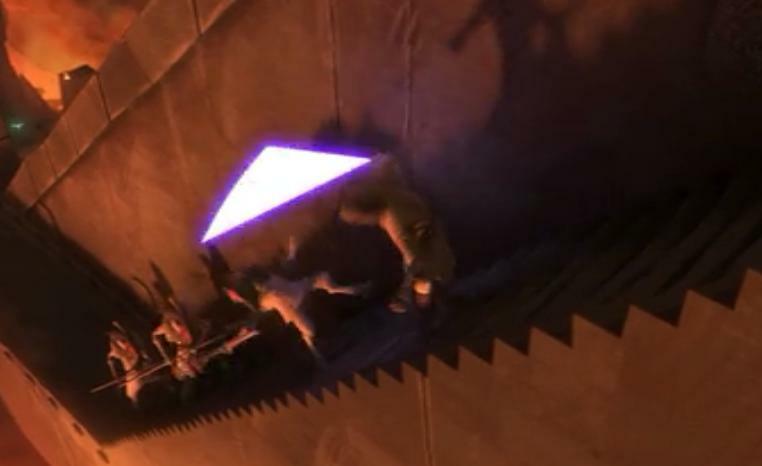 The pairing of Jar Jar with the stoic Mace Windu (who often seems as annoyed at Jar Jar as Star Wars fans) makes for a couple of amusing moments, in a storyline that takes some heavy influence from Indiana Jones, of all things. More importantly, even with Jar Jar by his side, it’s good to see Mace get a storyline of his own in the final season, since his spotlight moments were somewhat oddly rare on this show. He has one action scene in particular that is incredibly cool and badass. That and, of course, finding it fascinating that Jar Jar Binks has a royal lover. Nala Se: Lord Tyranus, you summoned me? Lord Tyranus: Prime Minister Lama Su tells me there has been a complication. What has happened to the inhibitor chip? Nala Se: It was stolen by a renegade clone. Lord Tyranus: What does this clone know? Nala Se: Nothing, as of yet. He’s just a soldier, after all. However, he was a friend to the clone who malfunctioned. Lord Tyranus: This behavior is unsettling: first, the malfunctioning clone and now a renegade. Are you certain these soldiers will live up to your design in the end? Nala Se: I am certain the malfunction to the inhibitor chip is an aberration. Lord Tyranus: And how do you explain the renegade? Nala Se: I’m afraid the Jedi have inspired creative thinking in some of the clones. That is the cause of this type of divergent behavior. Lord Tyranus: Will this interfere with Protocol 66? Nala Se: No! I am certain of that. Lord Tyranus: Find the renegade clone immediately and make sure you recover the chip. The true nature of the inhibitor chip must not be discovered by the Jedi. Nala Se: Yes, Lord Tyranus. When it was mentioned that there was an “inhibitor chip” inside the Clones, I briefly wondered if maybe that term was true – that the Clones were, in fact, genetically programmed to kill the Jedi and turning off the chip was how Order 66 worked. But that term turned out to be all part of Dooku’s lie, complete with saying it was to curb Jango Fett’s naturally aggressive genetic tendencies. understand, finally, that Yoda in the Clone Wars period is not at all the same person that he is in The Empire Strikes Back. People, I think, have always wondered, “Why [in The Clone Wars] isn’t he like he was in Empire? He’s not as odd, and he’s not as quizzical. Why is he so much more serious in the Clone War and where’s the fun little Yoda who was wise?” Well, he’s not there yet, you see. The story that we tell goes a very long way toward explaining who Yoda is prior to the Clone War and who he becomes after the Clone War. “Why do you hate what gives you power? 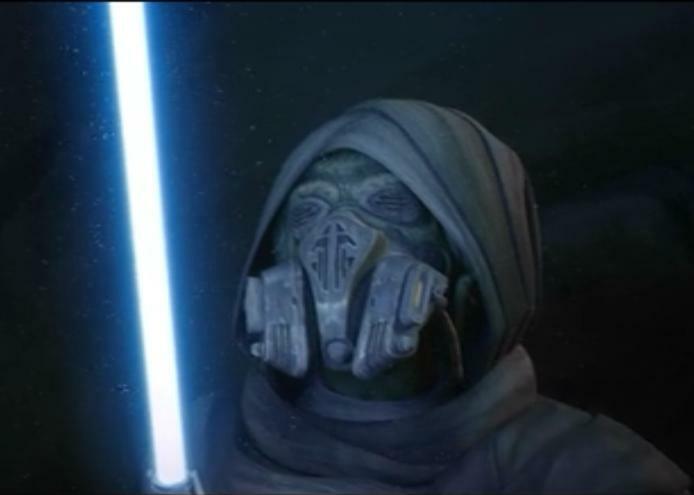 – “Sacrifice” – It is interesting to find out that the Sith have a home world and it’s pretty fascinating that Yoda decides to go there. 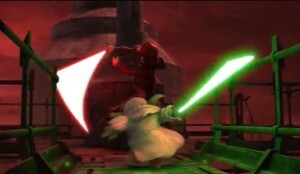 The exciting segment is at the end when Lord Sidious fights him in somewhat of a weird arrangement. Nevertheless, Yoda is unable to discover Lord Sidious’ true identity. – “The Disappeared, Part II” – There are some cool fighting scenes in this episode and we see Mace Windu tolerating Jar Jar Binks…. 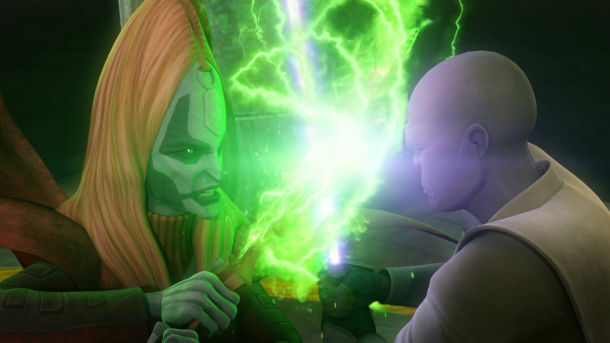 It was awesome to see Mother Talzin return and it was crazy to see her almost wield more power than the Jedi and the Sith, although she is defeated (and vanquished(?)). However, since he is dying and seemingly crazy, it is hard for Captain Rex and Anakin Skywalker to believe him.